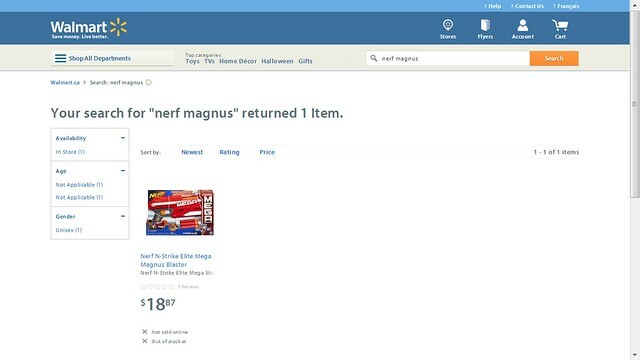 You heard to the Walmart Canada website and searched up Nerf Mega,you would get the above image for the upcoming Nerf Mega Magnus blaster. What makes this a bit more exciting new then usual is that we have a sort of price point for the blaster now. It’s being sold for $18.87. So we should see it being for for around that price in other stores. We also recently had this blaster confirmed yesterday by Nerf on Facebook. The description from the Walmart web listing of the Magnus can be found below. Description & FeaturesYour battles are about to get a whole lot bigger – Mega bigger! The Magnus blaster has the same high performance as other N-Strike Elite blasters, but it features bigger darts engineered to fire farther than ever! Launch Mega Darts at targets up to 85 feet away and dominate the biggest Nerf battle yet with the Magnus blaster. Its built-in, one-handed clip lets you reload fast to get back in the game, and it comes with 3 Mega Whistler Darts that scream as they fly! Hit the battlefield with Mega power with the Magnus blaster! /!\ CAUTION: Do not aim at eyes or face.